Chemical Constituents and Components : Main chemical components are saponins, sapindoside A and B, kaempferol, quercetin, B-sitosterol, palmitic, stearic, oleic, linoleicand eicosenoic acids, glycerides. Saponins: 1. It possesses potent spermicidal activity and used as a natural contraceptive. 2. It alters the sperm membrane physiology. 3. It exhibits significant anti microbicidal activity. 4. It inhibits platelet aggregration. 5. It shows molluscicidal activity against snails. 6. It is used for removing freckles. 7. It is very effective in neurodermatitis. Curing Diseases : 1. It is used against asthma, diarrhoea, cholera, verminosis and gastralgia dyspepsia. 2. It is used in lumbago, hysteria, dyspepsia and worm affection. 3. 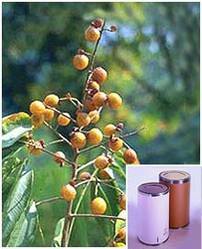 It is used as surfactant and used for washing hairs and fabrics.